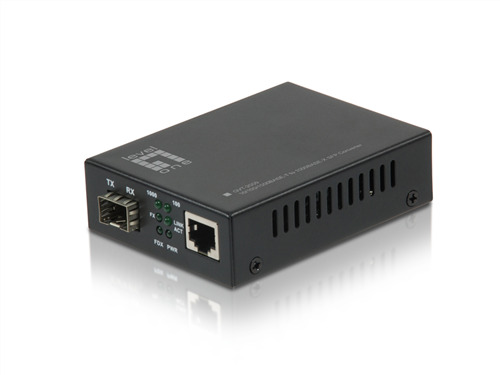 The GVT-2000 media converter is able to convert network signals between copper and fiber-optic based networks. This converter provides an SFP slot for 1000Base-X Gigabit optic module and am auto-sensing 10/100/1000Base-T RJ-45 port. This device features built-in Dip switches for enabling Smart LFP (Link Fault Pass-through), allowing the converter to monitor both the fiber and copper ports for signal loss, as well as cut through and smart pass through mode. The GVT-2000 is able to operate in temperatures from -10° up to 55°. It can be used as a standalone unit or as a slide-in module to the CHV-2000 19” converter rack, which can accommodate up to 14 units for use in a central wiring closet.